This painting by Norman Rockwell, Willie Gillis Hometown News, appeared on the cover of The Saturday Evening Post published April 11, 1942. This is yet another timeless favorite of Rockwell collectors, a classic for the ages. Another title for this painting is Willie Gillis on KP. This painting was Rockwell's third cover for The Post in 1942. 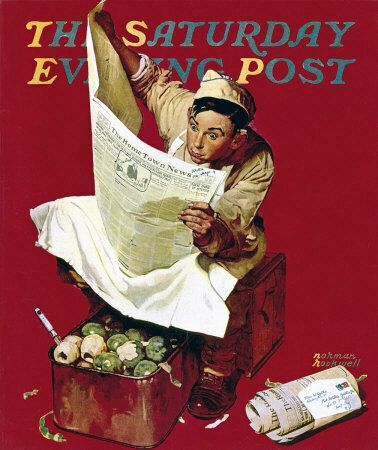 In 1942, there were eight Norman Rockwell Saturday Evening Post covers published. This painting was also Rockwell's 207th overall of 322 total pictures featured on the cover of The Post. Rockwell's career with the Post spanned 47 years, from his first cover illustration, Boy With Baby Carriage in 1916 to his last, Portrait of John F. Kennedy, in 1963. This is also the fourth in the Norman Rockwell Willie Gillis series of covers for The Saturday Evening Post. Rockwell painted eleven images that appeared on the Post cover and one illustration that was featured inside the Post. I have seen pristine original copies of this magazine cover sell for over one hundred dollars on eBay. And to think it only cost ten cents originally! And it was mint condition at that time, too. The original oil on canvas painting, 38 x 30 inches or 96.5 x 76 cm, is currently part of a private collection. on page 149 of Norman Rockwell, A Definitive Catalogue by Laurie Norton Moffatt. This classic Norman Rockwell painting shows Willie Gillis, America's boy next door, reading his hometown newspaper while serving on Kitchen Patrol. This is the painting in Norman Rockwell's Willie Gillis series that cemented Willie's image as the all-American GI. After this painting was published, Gillis became perceived as the boy next door serving in the war. We can see from the envelope lying on top on the bundle of newspapers that Willie has not yet left for the field of battle. The envelope is addressed to Private Willie Gillis, Fort Dix, New Jersey. The package is sent by his mother, Mrs.W.Gillis, Arlington, Vermont. Willie is taking a break from peeling potatoes It doesn't look tome like he has made a lot of headway in that potato bin. I only count three potatoes peeled,but he had started on a fourth one. Apparently, the call of his hometown newspaper was too great to resist. He probably greatly misses his hometown and this package from his mother probably re-enforces those feelings. Willie Gillis Hometown News was only one of 322 Norman Rockwell Saturday Evening Post covers; Here is the list of Norman Rockwell Saturday Evening Post cover illustrations. Still, he looks pretty perky and deeply engrossed in reading the newspaper. The newspaper is probably not his first break. A half smoked cigarette is perched behind his ear, ready for the next break. It could very well be that this is not his first container of potatoes for this stint of KP. I did a quick check to see if Arlington,Vermont had a newspaper called The Hometown News. There are currently no newspapers published by that name in the Arlington area. Does anyone know if there was an actual newspaper by that name during the 1940's?